This recipe is totally inauthentic, but it tastes amazing. 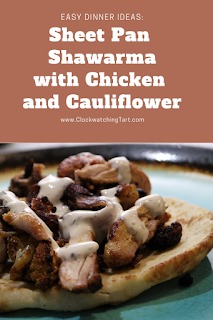 Chicken shawarma is one of my favourite take-out meals, but it's not so easy to make at home. This version gives you the wonderful flavours of chicken shawarma, with a hit of healthy vegetables and an amazing, easy white garlic sauce. Serving it on mini-naan bread, taco-style, makes it a decadent, delicious one-pan dinner. The recipe is inspired by this one at Food52, but I've made some changes and added the awesome white sauce. Roasting the veggies and chicken together on one tray makes this one of the most easy and delicious meals I've made in a long time. These mini-naan make a perfect serving vessel for the shawarma-flavoured filling, but if you can't find them you can use pita or any other flatbread, warmed until soft. Or just serve the chicken mixture on its own or over rice. Just don't forget the sauce! This white sauce is amazing! I love this sauce, and I've seen some very complicated recipes for it but this one is so simple, tangy and garlicky, it's perfect with the rich shawarma and naan. You've got to try this recipe. Preheat the oven to 425 degrees. Place the cauliflower and onions in a large bowl and coat with 2 tablespoons of oil. Mix together all the spices, salt and pepper. Toss half the spice mixture with the cauliflower mixture until it's covered. Spread the cauliflower mixture on a large sheet pan and roast for 20 minutes. In the same bowl, coat the chicken thighs with 1 tablespoon oil and the remaining spice mix and let sit at room temperature. When the cauliflower has roasted for 20 minutes, remove the pan from the oven and toss the cauliflower. It will have shrunk a bit. Make room on the pan for the chicken thighs and spread them on the pan in a single layer around the cauliflower. Roast for 20 more minutes, checking halfway through and flipping the chicken and tossing the cauliflower so it doesn't burn. Some parts of the cauliflower will get quite dark and crispy. This is good! Meanwhile make the white sauce. Mix all ingredients together until smooth and runny. Taste and adjust seasonings (add more salt or garlic if needed). Refrigerate until ready to use. When the chicken and cauliflower are done, remove the pan from the oven. Heat naan according to package directions or warm pita or tortillas, or serve over rice. Pile the chicken mixture on warm bread or rice and drizzle with the white sauce.